Early Bloomer. 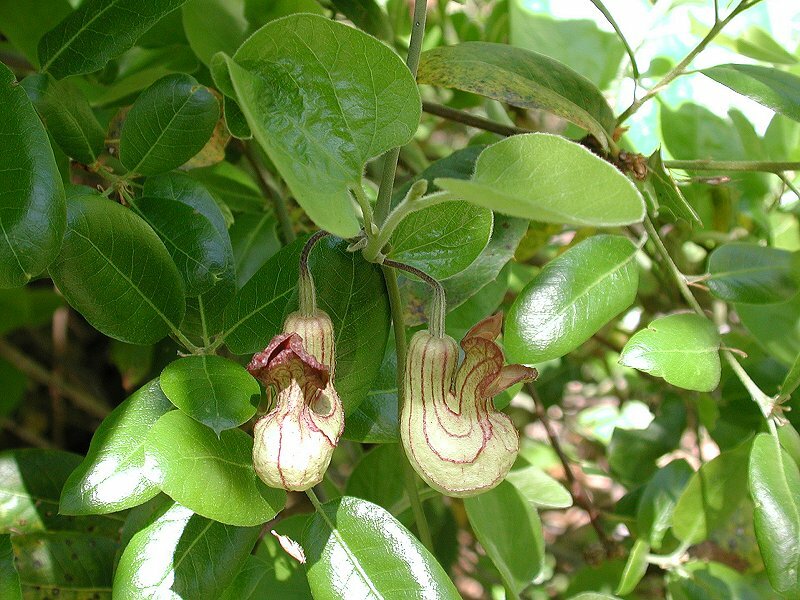 Green/brown pipe-shaped flowers, purple lines, woody vine, velvety heart-shaped leaves. Notes: Birthwort Family. From the Greek ‘good birth.’ They are woody vines with aromatic roots used in folk medicine to aid in childbirth. Also called Birthroot. Flowering sometimes begins as early as January. The distinctive ‘U’or pipe-shaped flowers are foul smelling. Therefore, flies are the main pollinators, attracted by the strong, fetid odor. 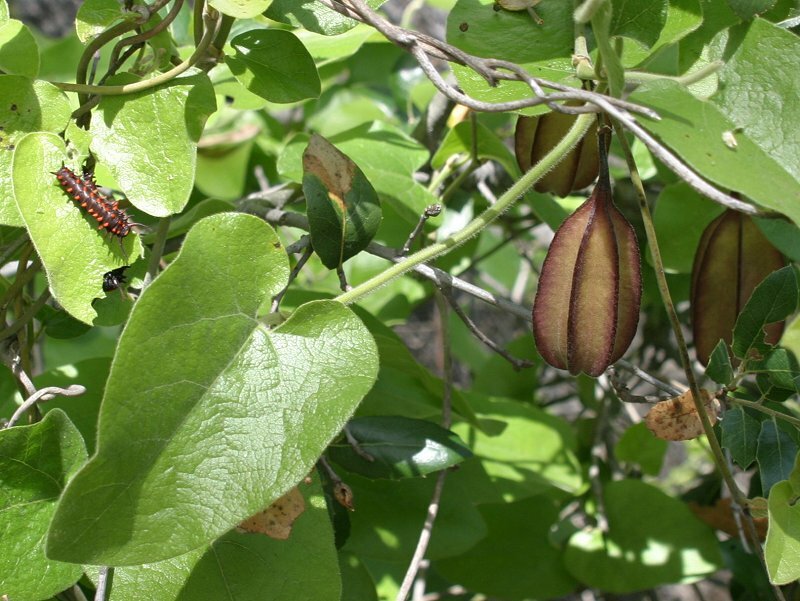 It has distinctive ‘shovel’ or ‘heart-shaped’ leaves. Later in the spring fruits develop that look like the ‘star fruit’ from the grocery store. In one species the shape led people to believe it had medicinal qualities for the heart, and the leaves were used as a tea for a heart tonic. Our beautiful dark, iridescent Pipe Vine Swallow Tail Butterfly depends on this plant as a food source for its caterpillars. Late in the season they can be seen: black, bristly, red spotted creatures, crawling and eating, especially on the underside of the leaves. It’s a fine plant to grow over a trellis. The beautiful Pipevine Swallowtail butterfly feeds on Pipe Vine leaves. 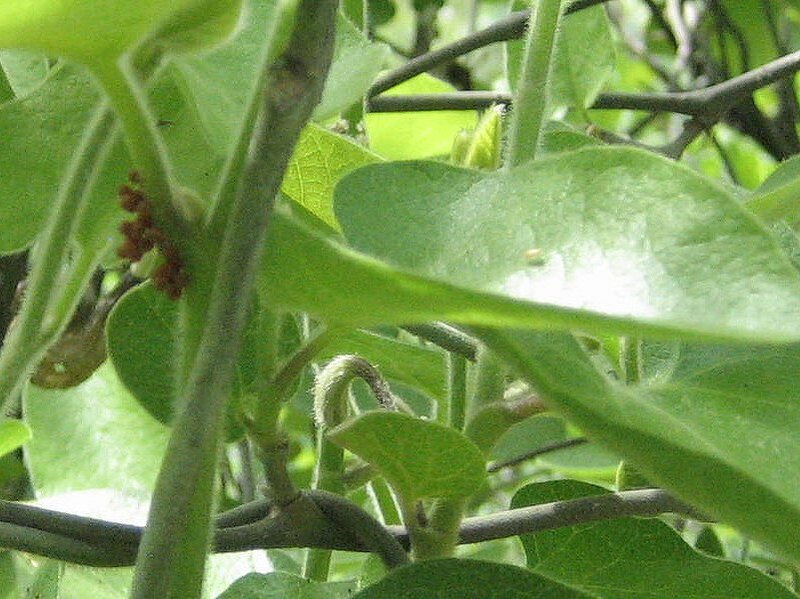 In this picture a group of about 15 to 20 eggs is attached to the underside of a leaf stem, away from sun and birds. By late April the eggs have hatched and the swallowtail caterpillars gorge themselves on the leaves. The pipe-shaped flowers have become the interesting seed pods you see here also.